Two Bands (Greek Dark/Gothic Metal & Swedish opera/pop-duo) Finnish Dj (Drum & Bass) 2006-present ELYSION were founded in 2006 by guitarist Johnny Zero & by singer Maxi Nil who, by welcoming on board talented musicians of different backgrounds, soon shaped up a highly promising team, with music approach consisting of many shades of atmospheric and metal elements mixed pop/rock formulas as well as alternative/electro and Gothic influences. ELYSION were founded in 2006 by guitarist Johnny Zero & by singer Maxi Nil who, by welcoming on board talented musicians of different backgrounds, soon shaped up a highly promising team, with music approach consisting of many shades of atmospheric and metal elements mixed pop/rock formulas as well as alternative/electro and Gothic influences. Recording the demo right away, which was immediately elected as ?Demo of The Month? in Metal Hammer Magazine, ELYSION received excellent critics in webzines and magazines, complimenting utmost on the exceptionally professional sound witch gladly matched European and American high standards. Giving their first interview to Metalmare Magazine (GR), ELYSION right from their very first months of active presence were hosted in numerous columns and were interviewed for radio stations and TV music shows, all this causing the music soon to spread and help them receive several awards (one of them being Fillipos Nakas pop and rock awards 2006 for best band). In the following time ELYSION, among many concerts, were invited to headline in important rock and metal events and also had the pleasure to support a great number of top artists of the scene, most importantly The Gathering, Christian Death, Diary of Dreams, Star Industry. In July 2008, ELYSION's frontwoman was honored to be invited to join the stage with Moonspell in ?Rock ?em All Festival? presenting Pain of Salvation, Meshuggah, Lacuna Coil, Iced Earth, Venom and perform as a guest singer by the side of Fernando Ribeiro. 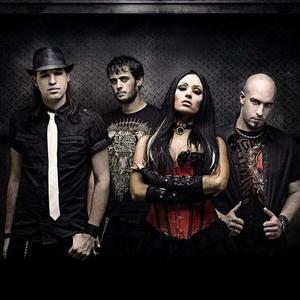 Also in 2008 the band separated their paths with Maxi Nil under good faith and Christianna was the next front woman. Then they entered the studio for the recordings of debut album, which, achieving to be an excellent sample of ELYSION's potential, soon attracted the attention of numerous record labels, leading in signing up with Massacre Records. In the next months ELYSION completed mixing and mastering of the album, having the great privilege to work with America's top engineer Ted Jensen (Madonna, Evanescence, Iron Maiden, Slipknot, Nickelback, Korn, Marilyn Manson) and have their music mastered in his very owned Sterling Sound Studios, thereby gaining and important advantage of very high -standards production. The cover of the album is created by Natalie Shau (Lacuna Coil, Poison Black, The Duskfall). The artwork and the photographs of the booklet is a creation of Seth Siro Anton (Moonspell, Paradise Lost, Exodus, Soilwork, Septic Flesh). In current time, ELYSION in terms of promoting debut album ?Silent Scr3am? which is to be released in fall 2009, are touring Greece and making the final arrangements for their European and American tour. Elysion is a Swedish opera/pop-duo. The group consists of Hannah Holgersson and Anders M?rtensson. Their probably most famous song is "Golden Star", the song they competed in the Swedish outtake for Eurovision Song Contest 2006, Melodifestivalen, with.